Only 7 days left in my series! 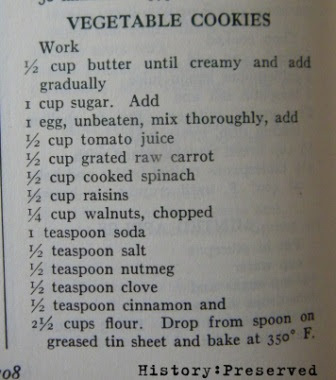 Day 24 is this interesting recipe for Vegetable Cookies from The Alice Bradley Menu-Cook-Book, published in 1944. When I first saw the recipe title, I thought it would just have carrots or something. Nope! These are true vegetable cookies with tomato juice, grated carrot and cooked spinach! These would be really interesting to try, and I'm sure you could make other veggie substitutions depending on what your harvest has brought. Be warned if you try it though - this recipe makes 6 dozen cookies!